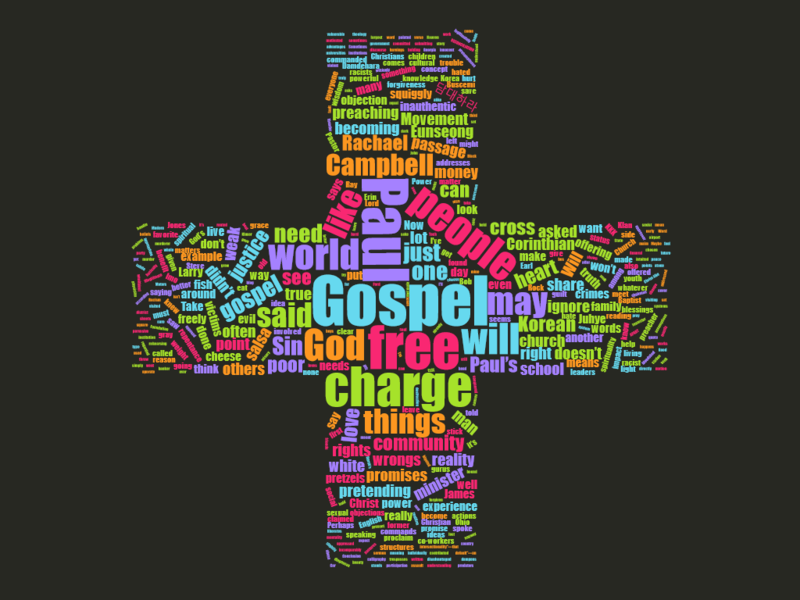 “Compelled to proclaim freely” – 1 Corinthians 9 – Habitually Being: thoughts worth living. I didn’t know what it was, except that it was fish, on a stick, kind of gray, and squiggly. Imo (aunt), the “host-mom” of the family I stayed with when I lived in Korea, had been stressed about me losing weight recently. And I didn’t want to stress her out more. I doused the stick-of-fish in red pepper paste and stuffed it in my mouth. I was going to chew and swallow, and everyone would think I LIKED it. I could not hide my displeasure. As the poet Theodore Roethke wrote, “My secrets cry aloud/ I have no need for tongue/ My heart keeps open house…” and my goodness I hate the squiggly fish on a stick. On the flip side, my co-workers asked me to bring in my favorite “Western snack” for them to try. That would be chips and salsa. All I could find were pretzels and ….Rico’s nacho cheese sauce. My co-workers gingerly dipped pretzels into the “cheese salsa,” as they called it (because I had told them I was bringing salsa). They hated it. What’s worse is they said: “Oh, it’s very delicious”. My “Korean older siblings” from church, Oh Juhye and Oh Eunseong, were comforts amidst all my failed cultural and culinary exchanges. She was being very kind. In short, I felt like a failure. A fraud. We got lots of talks in Fulbright orientation about being “cultural ambassadors” and building bridges by being as culturally involved in your host-family and community as possible. And here I was thinking everyone around me—INCLUDING MYSELF— was very transparently, and badly, forcing themselves to do things they hated and lying to people they were trying to make feel better. In our passage, folks in the Corinthian Christian community are VERY concerned with money. There are haves and have-nots. In “The Great Gatsby” terms Corinth is both New-Money West-Egg and the trampled-upon, poor Valley of ashes. In Corinth, not just money, status matters. There are many issues; and most seem to be sociological, not theological—their treatment of others— rather than explicit doctrine. Spirituality is one status symbol among many. They want the speaker with the most watched TED talk, who are featured in Oprah’s book club: REAL spiritual gurus. Some begin to think: maybe this Paul doesn’t stack up. Paul’s spirituality, it seems weak. And, they seem concerned Paul is working with his hands – like a common laborer – and rejecting their money. Paul responds—the foolishness of preaching the cross is God’s wisdom; the weakness of the crucified Lord is the Power of God. Paul offers not mere spirituality, or signs, but the truth of the cross which shames the wise: God come down to die an unspeakable criminal’s death. He addresses his refusal to eat meat sacrificed to idols—which the Corinthian community attributes to a lack in “knowledge”. Who you dine and associate with, it matters. And you’re limiting your social capital if you do what Paul does. But Paul’s message here is that he will give up his rights. He will be all things to all people, so that he might present the Gospel free of charge. Paul preaches freely for a reason, one we can learn from, to become a living example of the Gospel itself. Understanding why he is doing this, helps us understand what it means that the Gospel is freely given. It may help to look at 3 objections to what Paul is saying in our passage today. That becoming “all things to all people” is “inauthentic”. That offering the gospel “free of charge” means one’s wrongs are not taken seriously. That a Gospel which is “free of charge” doesn’t help us live rightly. The first objection we may have to Paul’s Gospel is that being compelled to do something, or that becoming “all things to all people,” is “inauthentic,” insincere, duplicitous, unnecessary. Paul, after all, says he is under an obligation. So, is Paul just pretending to like the squiggly gray fish or pretzels and cheese salsa? Or pretending he doesn’t like them, to be around the people who don’t? Paul’s point is that he not like the hired special and spiritual gurus promising knowledge. He profits from something ELSE entirely than money: the gospel itself. There is a lot of debate about the section right before this passage regarding the gritty details about food and idols. I won’t get into them. What is clear, however, is Paul’s stance. He is not afraid to identify with those under the law, or those not under the law—or, notably, the weak. Paul wants to share the Gospel, without barriers, to all. This is not a matter like Steve Buscemi pretending to be young, when he is not. Or me pretending to like squiggly-fish-on-a-stick “just like a Korean,” when I don’t. This is a matter of serving others, loving by example. Attended the founding meeting for the Dr. King’s southern Christian leadership conference, the only white man invited. Been run out of his position as campus minister at University of Mississippi for his Civil rights activism. Escorted the Little Rock 9 into school, standing between them and the seething mobs of those viciously opposing integration. Counseled Freedom Riders and marched in Birmingham in 1963 when water hoses, and dogs, were turned on protestors. Ministered to the families of the victims of the 16th Street Baptist Church bombing. So why was Will Campbell also known as the “civil rights chaplain to the KKK”—Why did he visit Bob Jones, the grand dragon of the KKK, in prison? Why did he minister to James Earl Ray who killed his friend. Dr. King? All things to all people. Surely not for this. . . . Certainly, he could have claimed to have put all those racists, all that past behind him. He had the right. He had proven by his actions he was better. Even though more than perhaps any white activist, he could have justly declared have truly put racism behind him, there Will Campbell was—visiting white supremacists. This leads us to our second objection: doesn’t a Gospel free of charge ignore our wrongs? Does it not ignore the evil in the world? That is not how Will Campbell saw it at all. It was precisely because we are wholly unable to act out salvation, we can recognize the gravity of Sin. Sin is both a Power we need liberating from AND a fault for which we need atonement—to be put right. Campbell knew this. He offered the Gospel free of charge, because he knew how deep in Sin humanity really is –and it didn’t always make him friends to say so. He made more than a few hate him by speaking at universities. Sometimes he would say “this institution right here” -meaning Ohio State or Georgia Tech or whatever school he happens to be visiting – “has contributed, wittingly or not, to incomparably more bloodshed and misery, done more to maim and murder, than the whole lot of poor old country boys in sheets holding cross burnings in rented cow pastures. Not all crimes are created equal. But we are all alike sunk in Sin. Modern discourse in social justice has intuited this truth, when it comes to ideas of “intersectionality”—that one can be oppressed on one way, and benefit as an oppressor in another— ALL APART from just individually chosen actions. You can be disadvantaged and poor, and still have other advantages for being white –for example. I’m a white male, who went to the wealthiest school district in Ohio to boot. I benefit, and too often operate, from racist, sexist assumptions and systems. I grew up with sometimes subtle, but pervasive, beliefs that my needs and my ideas can be regarded as “the default”—an idea directly opposed submitting to others’ needs in Christ-like love. And, according to any government I’ve been under, I’ve committed no crimes. What Campbell points out is because of the reality of Sin in our world, none of us are innocent. “RECONCILIATION!…,” he would thunder, “Our trespasses are not held against us, we’re already forgiven. Don’t you see how that liberates us all? By rehearsing this story of Jesus, by offering the Gospel free of charge, we learn God is God and we are not. God has acted. Christ has freely given. Nothing could reaffirm more the reality of our wrongs, than this blessing of the Gospel. Rachael Denhollander was the first of more than 150 survivors, mostly former gymnasts, to come forward against Larry Nassar, a former physician. I won’t go into detail about his many, horrid crimes of abusing those under his care. What must be said is Rachael spoke up to declare that what Larry did was wrong, that his victims should be believed and are never-at-fault for the harm done to them, and that justice must be enacted. In her impact statement Rachael addressed Larry, who had brought a Bible into the courtroom in early proceedings. “ Should you ever reach the point of truly facing what you have done, the guilt will be crushing. And that is what makes the gospel of Christ so sweet. Because it extends grace and hope and mercy where none should be found. The objection that Gospel “free of charge” does not help us seek justice, is the most potent objection to what Paul is saying here. Because, too often, that is how it has been misinterpreted. And yet, in this same letter, Paul is clear about what should happen to a man practicing sexual immorality in the Corinthian community “of a type not found even among pagans….You are to hand this man over… for the destruction of the flesh.” (1 Cor 5:1, 5). Would it be any surprise the reason the Corinthian community not only allowed his behavior, but BOASTED in it, because the man involved was wealthy or powerful? Perhaps he was one of the “spiritual” leaders people flocked to, and divided over. Rachael is too familiar with this phenomenon of protecting the powerful, at the cost of their victims. She lost her church for her advocacy for victims, when she discovered church leaders defending a pastor who had covered up abuse. She was dismissed as someone who sat around “reading angry blog posts all day,” because of her previous experience. She was asked to leave the church. Good works cannot cover up the wrongs of those who hurt others. And the Gospel given free of charge cannot be legitimately used to further the hurt of the vulnerable, because the Gospel stands to free is from such Sin and atone for our participation in it. Now, the largest word painted in the verse is 담대하라 (dam-deh-ha-rah). I look at it whenever I leave my room for the day. In English it means “Take heart”, be encouraged, be bold. It’s a command, with a promise. Do you know how often commands come alongside promises in Scripture? And there is a third element: true speaking about reality. Eunseong’s words had the same pattern: the reality – we may not see one another again. The command– be well. The promise– even if we do not see one another on this side of eternity, we will meet again. Proclaiming because you are obligated is not inauthentic. For whatever God commands, God also grants. God promises and gives us the power to do what God asks. We proclaim a Gospel free of charge because we are claimed by it, and love because of it. Trusting God’s promises, does not ignore the evil in the world: for promises are made because of them. in this world, there will be unspeakable evil you may meet with a love for God’s justice, and a trust in God’s mercy. surrender your rights, and share in the blessings of the Gospel. Barrett, Charles Kingsley. A commentary on the first Epistle to the Corinthians. London: Adam & Charles Black, 1994. Fee, Gordon D. The First Epistle to the Corinthians. Grand Rapids, Mich.: Eerdmans, 2014. Garland, David E. 1 Corinthians. Grand Rapids, MI: Baker Academic, 2008. Hays, Richard B. First Corinthians. Louisville, KY: John Knox Press, 1998. More info at Christianity Today (interview) http://www.christianitytoday.com/ct/2018/january-web-only/rachael-denhollander-larry-nassar-forgiveness-gospel.html and CNN https://www.cnn.com/2018/01/24/us/rachael-denhollander-full-statement/index.html . Denhollander is not only a survivor, but an advocate and a lawyer for victims of sexual violence.